Both are wide-spread and globally used means of food. There is hardly anyone in today's world who has not heard of them, and as a matter of fact a lot of people use them as everyday food, especially in coastal areas of the Earth. They are used either canned or fresh. Although, we must admit that in some cultures one way of using them overweighs the other due to the unequal distribution of those fish around the world( generally in those parts of the world where these fish are abundant, the fresh one is more popular). In spite of their popularity, very few seem to go deeper into some details of those fish. We, although, strongly believe that in order to use them more considerably we should carefully look at some details. So in this article we would like to compare them profoundly through thorough research. The most considerable criteria for comparing these two fish, where we would like to dig even deeper, is their nutritional values. In order to be able to compare their nutritional content we firstly must take into consideration some well-known scientific facts about those fish. So, let's first take a look at the content of vitamins in both salmon and tuna. By looking at some obvious facts we can certainly tell that tuna is way richer in vitamins than salmon. Tuna is especially rich in vitamin A which salmon almost lacks. We should also mention that they both lack vitamin C. As for the minerals, they are both almost equally rich in them, although each one is rich in some particular minerals, with tuna being especially rich in phosphorus and magnesium, while salmon in copper and potassium. Coming to the cholesterol, it turns out that tuna is actually lower in it with a difference of 6 mg. Furthermore, the foods are equally low in sugars and glycemic index. It is also worth mentioning though that in terms of saturated fat salmon takes it all, being lower in it. 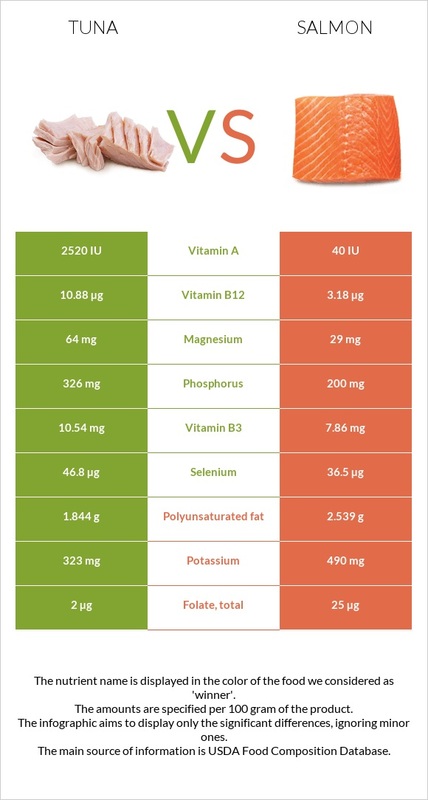 Summing all this nutritional comparison up, we can determine that tuna wins over salmon by little advantage in vitamins, cholesterol and in minerals such as phosphorus and magnesium. Having already discussed the nutritional values of both salmon and tuna we can now move on to criteria very much connected to nutritional content: the health impact of these fish. Based on some scientific studies we found out that these foods have some unexpected positive impact on our health. Surprisingly enough, they both decrease the chances of getting cancer! Speaking of salmon, it also improves your vision thanks to being rich in omega 3 fats. But apparently, it turns out that tuna is even better for your health for a number of reasons. Firstly, it is very high in protein which is extremely good for your blood, skin, hair and nails. Tuna prevents you from heart diseases as well. Moreover, it reduces the chances of obesity and improves your immune system. So, taking all these facts into consideration we can point out that although they are both quite healthy, tuna exceeds salmon in this sphere as well. To sum up, we should agree that in fact both salmon and tuna are quite good choices of food for the many nutritional values and health impact mentioned above. We should also agree that despite them being absolutely healthy and nutritious tuna excels salmon in nearly everything. Thus, having to choose between these two foods, we are more inclined to pick tuna and would like to advise you the same indicating as well that it is generally cheaper almost everywhere in the world than salmon.